Water is one of the five elements which form the ‘Panchatatva’. It is essential for our life. It is a part of the natural environment. When we think of water, we think of rivers, sea, waterfall, rains etc. Rain puddles are formed in the rainy season. By noon, the puddles vanish. The puddles disappear because the sun’s heat causes evaporation that changes water into water vapour. Water vapour cools to form clouds and from clouds we get rain, snow or sleet. 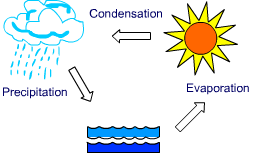 The process by which water continually changes its form and circulates between oceans, atmosphere and land is called the water cycle. Our earth is like a terrarium. The same water that existed centuries ago still exists today. Fresh water sources: These include the rivers, ponds, springs and glaciers. Salty water source: Ocean bodies and seas form a part of this. The water of the ocean is saline because it contains huge amounts of dissolved salts. Most of this salt is sodium chloride commonly known as the common table salt that we eat daily. Three – fourths of the earth’s surface is covered by water. But most of this water is available as saline water in oceans and seas. Freshwater is a small fraction of total water on earth. Due to this, in spite of living on the Blue Planet, we face shortage of drinking water. 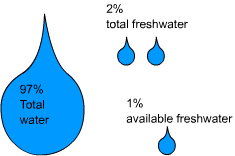 The following table shows the distribution of water in percentage. Use water filled in the bucket for bathing instead of a bath tub/shower.